Each week we release a podcast that can be listened to directly from the website, or streamed via iTunes or your favourite podcast service. Each podcast provides practical tips and knowledge from experts (often practicing clinicians) on a range of common and important clinical scenarios. For those who don’t have time to listen to the podcast or want a quick ‘memory jogger’ – a written summary of each interview is also available. Our blogs cover a variety of topics of interest to junior doctors and senior medical students. Blogs are arranged in different categories from purely medical through to advice on career development. In a climate of increasing pressure and competition for vocational jobs,our blogs are a useful source of expert tips on topics such as how to succeed in an interview, structure your CV or even diversify your skill set to pursue alternative careers in global medicine or digital health. Our blogs also touch on contemporary issues such the importance of mental health and work-life balance. We have recently introduced an onthewards consult guide to assist junior doctors with the task of requesting a consult. This aims to serve as one of hopefully many other quick reference tools for busy junior doctors whilst working on the wards. Despite many long years of study, many junior doctors often feel unprepared for the variety of tasks required of them for the day-to-day running of the wards. We realised there was a gap in the basic knowledge gained in medical school and the application of this knowledge in a complex real-world healthcare setting. Development of these skills occurs predominantly through experience and learning from senior colleagues. A formal education program can help embed knowledge and safe practice but many junior doctors struggle to regularly attend hospital-based lectures. This led to medical educators moving away from traditional lectures and using alternative methods of delivering educational content such as podcasts. This was associated with an explosion in free open access medical (FOAM) education resources. However, few of these online resources were aimed at medical students, junior doctors and doctors in training, especially those in the prevocational stage of their training. Moreover, very few resources were available that addressed the other equally relevant information sought by junior doctors that related to working in a complex healthcare system, navigating their career, and maintaining their health. onthewards was developed to address this gap and improve the availability of resources aimed at early career doctors. We started with a team of four, originating at Royal Prince Alfred (RPA) Hospital, Sydney, Australia, developing locally produced podcasts. After increasing interest from doctors across different hospitals we removed passwords and made our resources available to everyone. 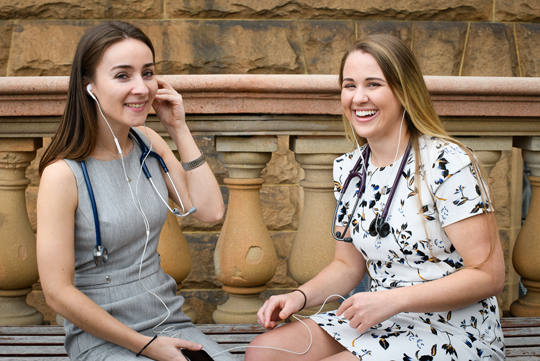 We are now a team of over 25 that includes medical students, junior and senior doctors as well as other health professionals from all across Australia. onthewards is a community run by and made for, a group of committed and enthusiastic junior doctors and other health professions. It is a safe, supportive space where doctors and others within the health profession can find education and peer support. Maintaining a great community starts with the way we look after each other. Whether we’re sharing ideas, talking in groups or managing a difficult situation we always strive to stay professional, constructive, respectful, flexible, supportive and open to new ideas. We won’t always get it right, and that’s ok. Rather we believe that so long as we remain kind to ourselves, our patients, our colleagues and our community then we’ll get it right enough – and that’s exactly what we need to keep onthewards thriving. Let’s keep having fun, listening, learning and asking questions of ourselves and of each other. The patient comes first, every time. We always protect the privacy and dignity of our patients and team by maintaining the highest standards of professional ethics and integrity. We all have something valuable to say. Our experience is not the only experience and our viewpoint is not the only viewpoint.Be open-minded. We support peers through discussion, share information, knowledge and educational experiences. We communicate and collaborate with transparency, openly, ethically, professionally and with integrity. We operate in an environment that values diversity, is inclusive and are committed to learning, questioning and challenging the status quo. We do not tolerate bullying, harassment or offensive attitude or behaviour. We are always looking for medical students, junior and senior doctors and other health professionals that are interested in joining our team.